Catch the shuttle to FedExField and get there just in time for the big game! Getting there is easy, safe, and budget friendly. Traveling is more fun with friends. Invite yours to join, or connect with other fans along the way. We care about answering your questions quickly and with accuracy. Whether you are looking for the bus or thinking about purchasing a ticket, we are just a phone call or quick message away. Thanks for making Shuttle to FedExField I Washington Redskins 2017 NFL Season a success. I want to bring tailgate gear with me to FedExField. Is there room on the bus? School bus shuttles only allow bags that can go into the stadium. Coach bus shuttles have luggage storage space in which you can bring your beer, cooler, portable grill, foldable chair etc. Please limit your equipment to 3 large objects per person. Propane is not allowed on board, for safety reasons. Do you provide parking for my vehicle near the bus pick-up site? No, we don’t. Riders are responsible for finding secure parking in advance. Why should I download the Bus.com app? Our app was created to help event-goers keep all their information (like tickets and itinerary) in one spot. 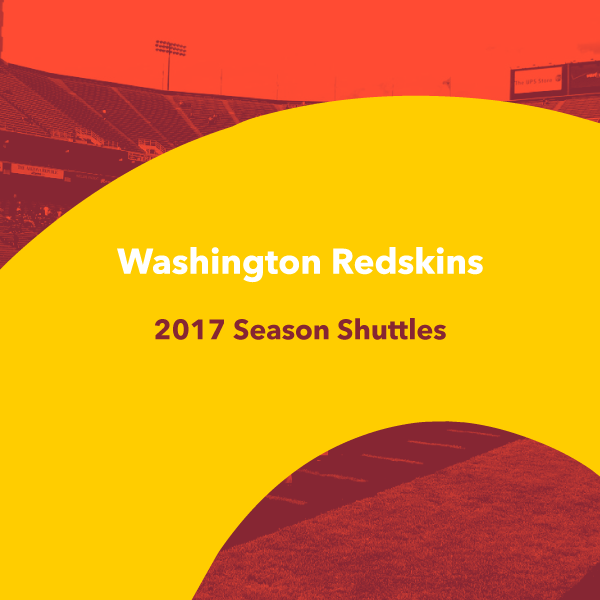 It features an in-app messaging feature that will let you communicate with other Washington Redskins shuttle riders before, during and after the game. It also puts you in direct contact with our team. When can I start tailgating at FedExField? School buses are scheduled to arrive 45 minutes before the game. Coach buses are schedule to arrive at least 2 hours before the game to allow for a proper tailgate! Can I drink on the bus on the way to FedExField? You cannot drink on our school bus shuttles. If you are on a coach bus shuttle you can (provided you are 21 years old and over)! But please drink from cans. Drinking from glass bottles is not allowed for safety reasons.